You want me to recommend your new work to our comrades in the army. Is that not unnecessary? Useful, interesting and patriotic, are values that recommend themselves sufficiently and my praise will not add to its certain success. With your knowledge of foreign languages you could get into the archives of other countries for unpublished documents and thus give your book the valuable character of being the most accurate of any similar subject. This is the first time that the drama so varied in its exploration is presented in a manner so complete, so real, so thrilling. You have cleverly managed to trace the role of cavalry in this final period of the First Empire, when the highest management of war was offset in part by the preponderant influence of the number. No question was more essential to be illuminated for so long to expose in all its truth, and we cannot thank you enough for having accomplished this difficult task. Your story is also eventful as a reflection of the action between the opponents. In this diary marching at the double, we see the vain stirring of all of the cavalry around which a legend was created if false. It collapses to the clarity of truth. You show us at work, without any understanding of the necessities of war, with its hesitations, its indecision, its lack of audacity, its judgments without cause, preyed upon by constant anxiety, letting itself at times be surprised, inquiring if it is not bad at all, when the opponent is reduced to almost nothing as he offers more counter attacks to the action of invading France. This moving page of history speaks loudly. By showing all the mistakes in the past, as the propylæum of the campaign of 1870-71 where the German cavalry, in similar conditions, did not fight any better than the cavalry, of the allies half a century ago. This comparison is obvious; it gives more interest in your book and makes it so informative. Proving once again that when rational exploration is conducted in either in the past or the present, it will undoubtedly inspire many of our brilliant cavalrymen with the desire to work towards better methods. We learn more by faults than success. In tracing the defective phases of exploration in all respects, you drive: I hope the efforts to make exploration more perfect in the future, and you'll have made an undeniable service to the army. It was not without some trepidation that we deliver for publication the first volume of this book that has cost us more than ten years of research and work and which, according to the plan we had originally traced, would have been found in the second part, the conclusion of our Study of the Cavalry of the Allied Armies during the 1813 Campaign. We wanted to remain faithful to this special program and limit it, by simply highlighting the essentially different processes employed by the Allied cavalry during these two campaigns and compare the spirit of initiative, the strength it had shown when it operated in a friendly country, the relatively restrained role it played during the campaign in France, the prudence, often carried up to being timid, which, except in a few special cases, hindered the initiative, denaturing the means of action of this arm from the day when coalition forces entered the country. But in 1814, if we except the raids carried out by the flying corps of Geismar and of Meininger, in northern and central France, a few blows of the hand more or less hardy and for the most part of secondary importance attemptedby Scherbatov, Seslavin, Kaisarov, Tchernitcheff and Thurn, the mass of the cavalry of Schwarzenberg and of Blücher dared not do anything without the cooperation and in the immediate vicinity of the armies of Bohemia and Silesia. We therefore decided we needed to extend the overarching framework of our study and follow step by step, day by day, the movements of armies. We also found in the imperial and royal archives of the war in Vienna, so many and so precious documents that, while continuing to focus attention on the role of the cavalry, we have been led farther than we had intended. 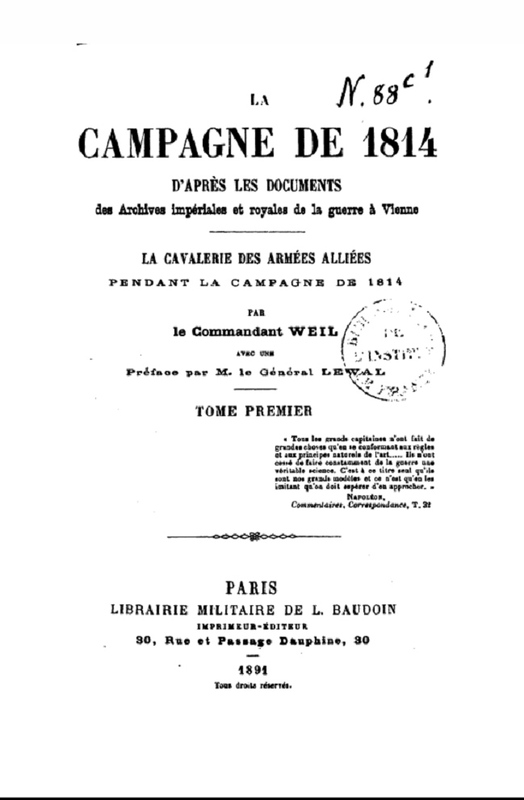 Thus, by force of circumstances, we were led to try to write, as M. General Lewal has asserted in his Preface, a journal marching on the double, to highlight the weaknesses , errors, hesitations, the defective organization of the command of Allied Armies, in a word a reexamination on new basis the complete history of the campaign in France. If we have not succeeded in this delicate and difficult task, we hope that one will consider our efforts and find at least in its length some interesting information, some useful lessons to ponder. We will add one more word to the preceding lines. We still have to pay the debt of gratitude we owe to the Austrian officers whose courtesy and kindness made our research so easy. Also, although several years have elapsed since then, we have not forgotten the gracious and friendly host who had been in Vienna, as well as the Department of Archives and the war we had in issuing this first volume was sent to H. E. Feldzeugmeister the Baron Bock, Chief of the General Staff of the Austro-Hungarian Army, his deputy, Field Marshal-lieutenant Galgotzy, and officers that we had the good fortune to find at the K. K. Kriegs Archive, a testimony, very weak, very late, but our sincere, deep and abiding gratitude. © Copyright 1995 - 2016, The Napoleon Series, All Rights Reserved.